IN 2006, Panamanians approved the expansion of the Canal mainly so that it would be more competitive and boost the country's logistics development. 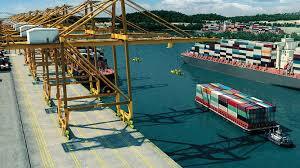 The port of Corozal is an initiative derived from the expansion, which has been stopped by multiple legal actions. Our backwardness a is a bonanza that others seem to know how to take advantage of. The message that the delay sends to the maritime industry is contradictory to the logistic development that the country promotes. The National Government should lead this initiative, ending the Pacific port monopoly and addressing the concerns of the neighbors of the area. What dream ? Saved from a nightmare more like. The Corozal project was dreamed up by the Canal Authorities as a way of expanding their influence outside that of operating the Canal - which should be their primary focus. This is the team that underscoped the new canal expansion ,to which the article refers and is now faced with selling the concept of having to build yet another set of wider locks to correct this error. There is already sufficient capacity ,with the new expansion of the competitive Rodman development, without introducing more traffic into an already heavily congested area. Corozal was badly thought through and should be abandoned in favour of future port facilities north of the bridge, if indeed any additional facilities are needed. Someone has a vested interest in Corozal and it sure isn't the citizens of Panama.